Today’s color is blue, and since most blue cards are played in control decks, you can expect blue colored control decks to take a beating after the rotation. Card draw, cards that use the graveyard, and powerful counterspells are all rotating out at the end of September. Below is a list of blue cards that I think will most affect standard when they rotate in a few weeks. We start off today’s post with Snapcaster Mage. His loss will be felt throughout the standard metagame. Non control players will be breathing a sigh of relief and control players everywhere will be crying their hearts out. No more flashing back an Azorius Charm, Supreme Verdict, or counter spell. No more flashing him with Restoration Angel to do the same thing . . . This has been a staple of every control deck since Innistrad came out, and it will continue to see play in legacy and modern even after it rotates out. I’m sure it will be reprinted in limited edition sets or the next Modern Masters, but I don’t think we’ll see him in standard again unless they bring Flashback back in a future set. I think we have at least 3 years before we see Snappy again, so if you can find him cheap pick him up now. I’m sure his value will go up in another few months, so if you can find him for a good price he might be a good investment now. Archaeomancer just isn’t going to cut it as a Snappy knock-off, so if you’re a control player you better prepare yourself to win the hard way again. Counter everything, blow stuff up with wrath spells, and land your win condition early then protect it. Time to go back to basics. Luckily Theros is giving us a similar card, the 1/3 Omen Speaker for 2 mana that Scrys for 2. While not as powerful as the Augur, it will still be a blocker on turn 2 and it will set up your next two turns. Without him control decks will have a shorter reach early on in the game, which will make them more reliant on card draw spells. His loss won’t be as painful as Snapcaster’s though. Bant Hexproof/auras is losing all of their good hexproof creatures. Without the Stalker and Geist of Saint Traft in place, the deck is going to become largely green and white. It will still have big beaters like Loxodon Smiter and the 1/1 Hexproof Elf, but not having an decent unblockable creature with hexproof will probably send Aura themed decks to Tier 2 status unless Theros gives it some good enchantments. Azorius has the Ascended Lawmage (3/2 flying hexproof), and Simic has Elusive Krasis (0/4 unblockable with evolve), but neither will really be able to fill the Stalker and Geist’s shoes. While it won’t get reprinted right away, I think we could see the stalker back in a future set in the next few years. Delver decks dominated the Scars/Innistrad block metagame due to cards like Vapor Snag and Ponder, but after rotation the deck really fell out of favor. Yuuta Takahashi proved it still had some juice left in it by making top 8 at GP Kitakyushu with a UW Delver build, but that was most likely its last gasp. Losing it in standard won’t make any impact at all, but I thought that a card that dominated for so many months before Return to Ravnica came out deserved some lip service. Cloudfin Raptor could take over it’s spot as a turn 1 flyer, but that card is largely dependent on others to boost it’s power and make it a threat. With a slower metagame it’s possible, but I don’t think we’ll see a deck similar to Delver builds again. I also don’t think this will ever be reprinted unless they make another Innistrad expansion in the future. 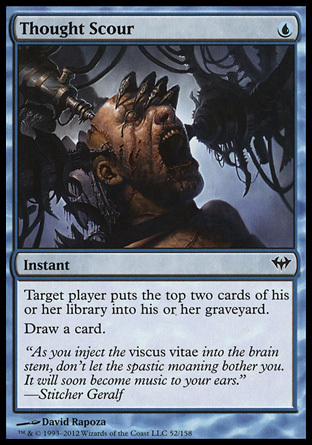 In a format defined by the graveyard and using it as a resource, this was one of the best counterspells in the Ravnica/Innistrad block. Control decks will be losing a strong counterspell but with less focus on manipulating the graveyard in the new standard meta, and many cards to deal with any problematic cards like the new Underworld Cerberus (Rest in Peace, Cremate, Rakdos Charm, etc), I think we’ll be fine without it. Cavern of Souls is also rotating out, which means all those Essence Scatters and Syncopates are going to become a lot stronger. Blue will be set up pretty well after rotation if you want to counter something. You’ll have lots of choices. We should probably see it reprinted in a future set as well. I know you are probably thinking this shouldn’t belong on this list, but here me out. A one mana tempo spell such as Unsummon have been around in standard since all the way back in 5th edition. 9th Edition was the only set that didn’t have unsummon, but other than that this card has been around for almost a decade. It’s the Giant Spider of blue you could say (which has been in every core set except for M13). How will the loss of this card affect standard? Well for starters it will make it more difficult for tempo decks, or decks that rely on removing obstacles from their creature’s path so it can deal damage, to work. We will have Cyclonic Rift, Disperse, Azorius Charm, and Simic Charm as tempo cards, but as you can see these all cost 2 mana and half of them need a second color. This makes it much more difficult to run these types of spells, and overall I think its loss will slow down blue based aggro decks. I’m sure it will be back, but not until M15 or M16. I believe this is the first planeswalker on my list that we are losing. She was a force to be reckoned with back during Scars/M12/Innistrad block due to her amazing synergy with Frost Titan. She could lock down an opponent and ultimate without a problem, and in Esper (BWU) control decks it wasn’t uncommon to lose from a Thought Scour being cast 15 times from thanks to her emblem. She saw a little bit of play in the Return to Ravnica decks, but as aggro picked up from Gatecrash onward, she saw less and less play. I think we will see her again in a future set (when we revisit the Kamigawa block perhaps? ), but who knows when that will be and she might also have a new form by then. Holding onto her is going to be a 50/50 gamble I think. Cards like Hidden Strings with Cipher will do what her +1 ability does, but there won’t be anymore of those Ultimate shenanigans in standard anymore, and that’s probably a good thing. I don’t foresee this affecting control much at all, but it will be sad to see her go. Think Twice and Thought Scour were probably my favorite blue common cards from each of their sets. I love drawing cards, and both cards were extremely useful in Innistrad/Scars block standard. They were a part of almost every control deck, and Thought Scour was an important cantrip for UW Delver decks during that time too. Once the RTR block came around and Scars of Mirrodin rotated, both card didn’t see as much play, but they both stuck around and peeked there heads out in the standard format from time to time. I’ll definitely miss Thought Scour and milling myself so I can maximize Runechanter’s Pike, and the loss of Think Twice and other flashback spells will also make me sad that I didn’t take advantage of them in a UR Young Pyromancer deck. There are cards like Divination, Inaction Injunction, and Pilfered Plans to take the roll of card draw over from these two cards, but they will be slower and less powerful I think. Alexander Hayne won Pro Tour Avacyn Restored with this card and miracles in a control deck, and to say it didn’t have an impact on standard would be a lie. 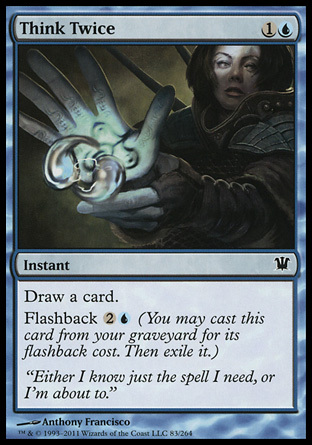 Temporal Mastery was an extremely powerful card in control before Return to Ravnica. When control was king, taking an extra turn to get one step closer to Tamiyo’s ultimate meant sure death. Back then there were more finishers in Esper (Grave Titan, Consecrated Sphinx), but with the printing of Sphinx’s Revelation and Aetherling, taking a turn suddenly became less favorable. We might see Ral Zarek getting more play in the new metagame for those control players wanting to take extra turns, and he’s probably your best chance at doing so. This card will probably not be reprinted, so it would probably be a good time to buy it cheap just before/after rotation in case it goes up in value due to play in other formats. You never know. Control is going to take the hardest hit with these cards rotating out of standard, so it might be a good idea to switch over to midrange or an aggro strategy for Theros if you want to win. It’s going to take a few weeks for control to find its new identity, and there will definitely be a few stumbles before it dominates again. We still have black, red, and green to cover before the the Theros spoiler list is fully revealed, and there are tons of cards that we are going to be missing. Which removal, which burn, and which creatures will we be losing at the end of the month? Find out in the next article! Look for part 4 to be out sometime this weekend. Thanks for reading, and please leave a comment if you think I left out any cards.